Thanks for coming to work sick. Written on January 31, 2006 by Kevin. Working in an office environment in the winter is bound to get you sick. While I can happily say that I fight off the majority of colds and bugs that others so gladly walk the office with, I can tell that I am about to get a sore throat. Certainly a nuisance but in the past, it was bearable. Now with a child, every new parent is going to do their best to keep the sickness from reaching them. I am curious to see what you readers can recommend to help combat the spread of colds from within a family. Once I get home, I will try some Airborne to see if that can help fight it off however if that doesn't work, I am not sure of the next step. I can stay clear of Rylan when I'm at home but that is going to cause Rylan to be fussy as he already gets mad when I'm late from work. This will also put an extra load on my wife as we share the duties and when I get home from work, I do the diaper changes and whatnot. Written on January 30, 2006 by Kevin. Recently Rylan surprised us with a few moments of laughter. I was playing with him and all of a sudden he began to laugh. As Jared has said a while back in a comment, his laugh is truly the best. You have never heard laughter until your child laughs for the first time. His laugh immediately caused my wife and I to laugh which just made Rylan laugh more. Of course when my wife gets the video camera out he stops. Dang kids getting shy. Rylan has only laughed minimal since this happening however we are dedicated to having him laugh when his grandma comes this week. Rylan's grandma has not seen him in person for over 3 months now so this week will be a great change for her. Written on January 27, 2006 by Rylan & Kaitlyn. Duckies! My mom and dad took me to a park this week and we fed the duckies. They were so nice to stare at and when dad threw them food, they all went crazy. It was fun. Teething is a big thing this week. The doctor said that I have a tooth coming but she doesn't know when it will be here. For now, Ill use my thumb to keep me calm and mom and dad give me Tylenol and teething tablets. Have you ever heard of a baby sleeping nearly 12 hours in one night? Well I did it. I did wake up a few times but nothing too drastic to cause me to scream. I just wanted to let my mom get some really good sleep. Overall, my sleeping is better than most babies I hear. Everyone talks about having babies that wont sleep through the night but I never really seemed to have a problem. Just another sign that I'm perfect. I must have gotten that from my mom. Mommy has her birthday next week and Grandma is coming next week too! It's going to be a jam packed week so look forward to a great update next week. Written on January 26, 2006 by Kevin. Since Rylan was born, my wife and I have not gone to see a movie. The combination of a strict feeding schedule and the potential of Rylan getting fussy was something we didn't want to deal with. This is still true to this day however now that we have been offered a few movie screening tickets, we are looking to attend. Call me cheap, but I wouldn't pay to see the movie and end up leaving half way through if Rylan got rowdy. The screening however is free and the only thing that may get disturbed are the other people who got to see the movie for free. We received movie screening tickets for Bambi II and Final Destination 3. 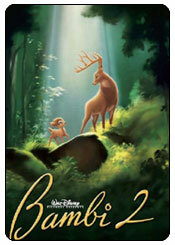 Bambi II is coming out on DVD soon but they are having an exclusive onscreen showing for the special people. Apparently, my wife is one of those special people. We figured it would be a great opportunity to test Rylan in a movie theater as it is a children's movie and most likely will have yelling kids anyways. Final Destination 3 will likely be filled with teenagers who will most likely hate us by the end of the movie if Rylan acts up. Our initial concern with taking Rylan to one of these screeners is that the tickets clearly state that they are good for you and a guest. No where do they mention children. After calling around to AMC and Harkins, neither of them had ever been asked if a child can go. My claim was that Rylan would not be taking up a seat, so he should be able to go. After looking into it, both companies confirmed that babies are allowed to go as long as they do not take up a seat. The best idea that I can come up with is to get to the screening early and find a seat that is closest to the door. If Rylan doesn't want to cooperate, I pick him up and take him out. This should keep the crying and other peoples comments to a minimum. Look for a report back after the movies. This could be interesting. We have been noticing for about a month now that Rylan has been drooling quite a bit and definitely has been chewing on his hand more often. My wife spotted a white spot on his gums which we figured was the beginning stages of a tooth coming to surface. Rylan is now into another phase of his life, teething. The stage in life that seems to be a great thing but can certainly be a bad one as well. Great because you get to see your child progress and get their first tooth and bad because it may take months to get there. Months with your child in potential pain. 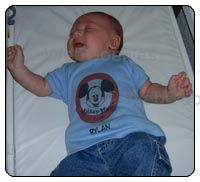 You can certainly tell that something is going on with Rylan because at times, he can become very fussy when in the past, he was not. We had to make a trip to the doctor recently due to a bump that Rylan got on his head. We wanted to make sure that everything was OK even though no blood was spilled. After good word that he would be OK, we asked about him teething and the doctor was able to confirm it. She however spotted the tooth in a different area of his mouth than my wife originally noticed. We now have about 5 different teething toys to keep Rylan's gums occupied and it does seem to help a bit. The main problem is that while he likes it, he cannot always keep it in his mouth which results in him crying. I am curious to see what other parents found that worked with the teething. 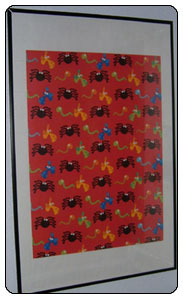 We have the toys that you can freeze and others that are simply fabric. Does anyone have any suggestions? Addition: I forgot to mention that we are currently using childrens tylenol and teething tablets. We were suggeted by a few people to try teething biscuits but the ones we purchased are for older children it seems. 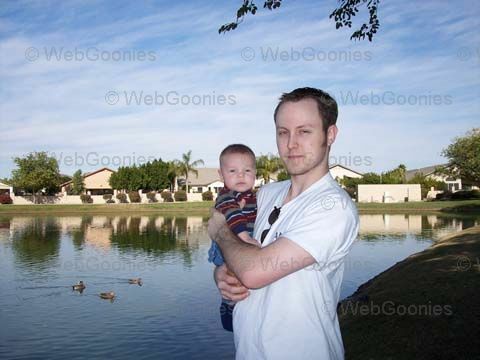 Top ten reasons Geeks make good fathers. Written on January 24, 2006 by Kevin. Sundays around our house tend to be pretty boring. Not too much going on so we have to dig for things to keep us all entertained. This last Sunday however I remembered a park near Rylan's grandmas house. A park that we will likely be taking Rylan too when he gets older and is capable of running around and playing. We decided that it would be fun and a great photo opportunity to take Rylan to the park. It is a pretty rare thing here in Arizona to find a park with a lake. The lake is filled with fish and while you are not allowed to fish, they certainly enjoy being thrown food. Food that the ducks and geese love too. The weather was perfect that day for a walk in the park. Rylan seemed to be amazed by all of the new things. We arrived at the park with Rylan sleeping in the back of the car but once we took him out, he couldn't keep his eyes off of all the new things. We enjoyed throwing the ducks and fish food and Rylan seemed to get a bit startled when the birds flew off in bunches. This place also has a playground so we figured we would see how Rylan would react to being taken down a slide. His response was nil. His expression didn't change at all. 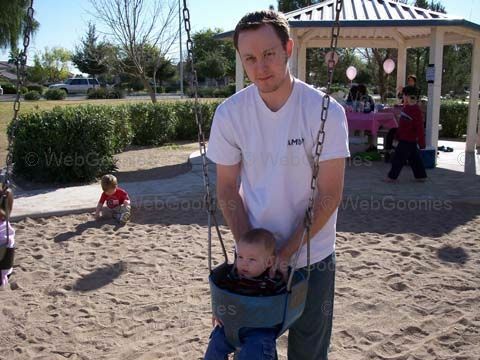 We even got a few pictures of him in a bucket seat swing. As shown in the picture, he barely could see over the seat edge and has quite a bit of growing to do before we can take him back. I think the park may turn out to be one of Rylan's favorite places to go. The combination of the ducks to chase and the playground to get all banged up at, will likely keep Rylan interested. I know that I cant wait to take him back. Written on January 23, 2006 by Kevin. What do you get when you combine a late night commercial and a cute baby? You get parents who take their baby to a talent agency. Every parent believes that they have the best looking baby but my wife and I believe that Rylan may have something more. We had always been joking about having Rylan in commercials and whatnot but when we were up late on Friday night, we saw a commercial for StarMaker. They basically have a database of people who would like to be in TV commercials, music videos, magazines and whatever else you can think of. We figured that this would be a good time to get him in. The first thing that I did was check them in the Better Business Bureau and while they did have some complaints, they were all resolved. I felt that at this point, we should continue to look into this. We got to their office and they really took to Rylan. The guy explained to us the possibilities and how things work and went on to say that they do have to turn down kids that have issues such as bad complexion or they are simply shy. Rylan however was in a great mood and was smiling and talking with the guy. He mentioned that Rylan does have a great personality and that he is the youngest child currently in their database. The deal goes, you pay some money up front and they put his picture in their database and on their website. When companies are looking for individuals, they will mention Rylan or the companies may simply see him on the website and ask about him. They don't really actively promote the kids but more or less wait for the work to come to them, which I understand. The amount of money spent up front could certainly be received back if Rylan was to be picked up. I figure that people spend money at Vegas trying to win big, spending money on Rylan with the hope of getting him money, is just the same. The picture up above is the head shot that they took for him. We had numerous pictures to choose from but we decided on this one because of his smile. Personality is key it seems and smiles can really show that. Look for further updates if anything comes from this idea. It should certainly be interesting. Written on January 20, 2006 by Rylan & Kaitlyn. Carter, is my new friend. He sent me an email this week saying hello. He lives in Canada, eh. I am jealous now because he gets to go to Disneyland even younger than I was. I bet he will have a great time just like I did. Last night, mommy and daddy setup a webcam so that me and my grandma can see each other. I get to see her in person though soon when she comes to town. It's been such a long time since she was here after I was born so she is in for a big surprise. I have grown so much. Heck, I am 3 months old now. Did you see my dads post about the diaper origami? I like to think that without me, he never would have had the idea. Why does he take all of the credit? Phewy! or should i say Poo'ey! I have mastered the art of falling asleep on my own. Whether it be in the crib, the car or in my swing, I fall asleep quickly now. My mom and dad love it as now they can eat without having to always hold me. I feel more independent now as well. Now I just need to get walking. Speaking of walking, I think that I will skip crawling and begin walking like a champ any day now. Yes I know that it is early but my legs are so strong. Right after I was born I was already pushing my way around the bassinet in the nursery. I can hold myself up for quite a long time and I just need to master this whole balance thing. I think that is all for this week, hopefully me and Carter can become best of friends and exchange more emails soon. Written on January 19, 2006 by Kevin. Children's Place, my wife's home away from home (except for Disneyland). If she had it her way, she would spend my entire paycheck, buying clothing for Rylan. What kills me the most about this store is that they go through their clothing so quickly and come out with new outfits. While this is great if you don't like the last outfits they were selling, its a problem when your wife loves everything. Every season, my wife is scouring the website looking for the latest and greatest outfit. While I must say, we don't buy everything, we do buy a few items here and there. Enter the outlet, where they eventually sell the older seasons outfits for a pretty well reduced price. I am happy to say that we took advantage of their outlet prices recently and snatched up some of the outfits my wife had recently been aching over. This can satisfy both of our needs, my wife's need for clothing and my need of saving money. I would like to once again welcome the fans of BloggingBaby.com. If this is your first time to WebGoonies.com, please take a look around. This is my third time being posted on BloggingBaby so I must have something people find interesting. Let me give a recap of some of my favorite posts. Yard sale find + timeless classic = fatherly fun / Restoration Complete. Written on January 16, 2006 by Kevin. Changing your baby was never meant to be something you can look forward to. It's one of those things that just goes along with being a parent. I believe that whatever you can do to make changing time a little bit easier or more enjoyable, take full advantage of it. So with this thought, I have begun, diaper origami. Origami, the art of folding paper, takes on a new change with diaper folding. Here are 4 diaper folding techniques that I have mastered in the first 3 months of Rylan's life. A great man once said; in time, will come more. Snow Cone - A difficult folding technique that requires skill and patience. Quite possibly one of the most difficult folds which in turn does a great job at holding in its contents. The vision that something may be sitting on top of the cone is what makes this technique a popular one. Small Package - This technique provides a very small compact finished product. You will likely be able to dispose of twice as many diapers in a garbage bag with this technique. What is kept within this small package can keep everyone guessing. Throwing Knife - Used for centuries now as a throwing knife to combat offending armies. It is not a fluke that diapers prepared like this caused bodily harm. The edges are razor sharp. Do not try this technique without proper guidance. Space Ship/Boomerang - This technique has 2 names depending on where you live. The Aussies call this technique the Boomerang due to it's similarity. It too, can be used for a weapon. Other parts of the world simply relate this to a space ship. The diaper can certainly contain out of this world contents. The best diapers these days are cloth diapers. They fit easily into the most common diaper bags and cut down on diaper waste. See the latest trends in organic baby clothes today! Written on January 13, 2006 by Rylan & Kaitlyn. What more can I say about my trip to Disneyland than my daddy has already mentioned? I had a great time. I got to meet some new friends like Winnie the Pooh and Mary Poppins. I got a bit anxious when I was standing in line to meet Winnie the Pooh and decided to cry. The picture turned out great though and that's all that matters. 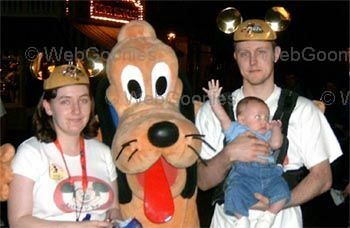 I would certainly recommend other babies go to Disneyland. Its a magical place. This week, I learned where my thumb is. I am now sucking on my thumb and loving every moment of it. It keeps me soothed and helps me fall asleep as well. For the first time in a while, I slept through the entire night without being swaddled. I even let mom and dad eat their dinner in quiet the past couple of nights. I wish I had found my thumb months ago. I grew out of my first set of clothing this week as well. I am a inch or so too big now for one of my pajamas. For all of those people who tell moms and dads that kids grow out of clothing too quickly and not to get 0-3 month, you appear to be wrong. In fact, when I was a month old, I was still not able to fit into some of my clothing. They were just too big. Its funny how people give advice that never seems to add up. I hope next week is as fun as this week has been. I wonder when I will be able to go see the dinosaurs again. They were huge! Written on January 11, 2006 by Kevin. The only one sure bet when taking a newborn to a park like Disneyland, is that your child is going to need to feed and be changed. Disney has you covered luckily. The Gerber Baby Care Center at Disneyland has been in existence from the opening day and allows a place for parents to take their children for a changing or feeding. At Disneyland, it is located at the end of Main Street on the right side. It is near the corn dog stand which I hear has the best corn dogs anywhere. They have a designated room for breast feeding mothers which dads are kept out of. My wife tells me the chairs are placed in a manner that makes it more private however there are not separate rooms for each women. 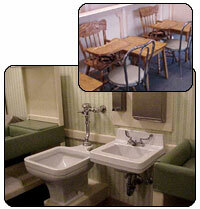 Feeding stations can also be found with high chairs and rockers so you can feed how you normally would. I counted 4 changing tables and they are quite nice. They provide a new piece of paper to put down under your baby to help contain the messes and keep things sanitized. Toddler sized toilets are also present. Fathers are allowed in the back to change the diapers of the young ones. They are also allowed for general feedings. Rylan enjoyed his stay at the care center about 5 times when we were there. Other times, my wife would take him to the nearest bathroom for a diaper change. I am told that Rylan was checking out all of the other babies and the girls seemed to really enjoy him. Turns out he is shy and wont talk with the girls though, just sits back and admires. Quite possibly the most important thing that this center offers, is that they sell food and diapers. While they are overpriced, they would certainly be a godsend in the case of an emergency. The diapers cost $1.00 each and jars of food and formula are near that price as well, if I remember correctly. They also have bottle warmers and an area where you can clean out bottles and jars. Other necessary items can likely be purchased however they have limited supplies it seems. Disney certainly tries to benefit everyone when at the park and this is no exception. I would certainly recommend checking into this care center the next Disney trip you make. Each Disney park location including California Adventure has one so I would recommend contacting the park prior to your trip for more detailed information. This continues to be one of the lesser known parts of Disneyland so it rarely gets busy. I am curious to know exactly what is this big toilet looking object in the picture though. Any ideas? Written on January 10, 2006 by Kevin. 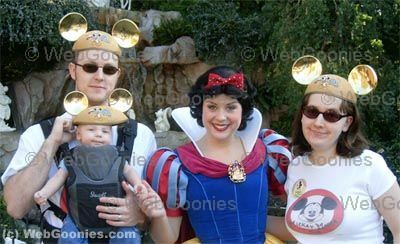 If you plan on going to Disneyland with a young baby, your first thought will likely be whether or not your baby will be able to go on any of the rides. This certainly passed through our minds so we went digging for answers. The Disneyland.com website had a nicely laid out list of rides and attractions that toddlers were able to attend. After digging around, we found no list that lets you know where infants are allowed to go. 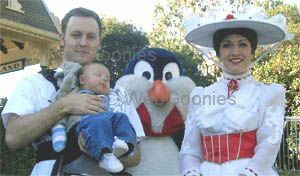 The toddler list certainly gives you a good idea however a list of Disney ride and attractions for babies may be helpful to other parents. Furthermore, the list from above does not have the some of the valid rides listed. Your best bet would be to simply ask the cast member outside of the ride whether or not a young baby/toddler can go. The Haunted Mansion ride begins with the elevator down to the true ride beginning and during that, it can get pretty loud. Screaming from the young girls (why do they do that?) and just the audio of the ride itself made it clear that I should be covering Rylan's ears. The ride itself was not as loud however there are bits that may warrant the covering of ears again. The Pirates of the Caribbean was another great ride that we were allowed on. For those who do not remember, this ride has 2 dips that can get you wet and drop out your stomach. Rylan slept through these however moved a bit around when he got hit with some cold water. We were not certain whether the fact that the ride is in the water would keep Rylan off the ride, luckily for us, it did not. Rides such as Big Thunder Mountain Railroad, Space Mountain and the Matterhorn Bobsleds are certainly off limits. While I had wanted to go on the recently re-opened Space Mountain, the wait was outrageous as you would imagine. If the ride line would have been shorter, we would have taken advantage of the Baby/Children Pass. From what I understand, each ride has this option where 1 adult stands in line, and goes on the ride. 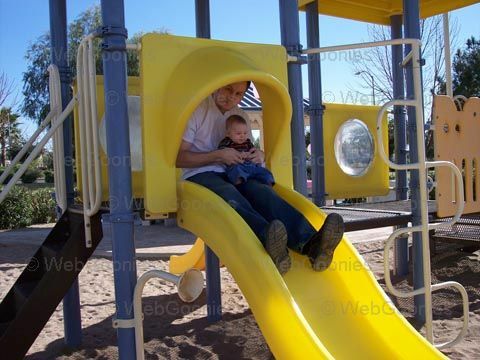 Once done, the other adult goes through the back and rides it after switching the child to the first adult. This allows both adults to ride without having to stand in line twice. The bottom line is that even with a small child, Disneyland rides are still possible. The only concern you may have is whether or not you want your baby on a psychedelic ride like the Many Adventures of Winnie the Pooh ride. On a side note, if you are interested to see what the new Space Mountain looks like but cant make it, check this out. This is the ride remade through the Roller Coaster Tycoon 3 game. Pretty impressive. Written on January 9, 2006 by Kevin. Too all people who believed that taking a 2 months old to Disneyland was a poor idea, Rylan has given proof that you can successfully take a young child to a very public park. Disneyland is a 5 hour trip here from Phoenix and Rylan did a wonderful job going both directions. He slept most of the trip and we only needed to stop once each way for feeding and changing. Otherwise, he kept to himself for the most part. We were very proud of him. My wife and I went to Disneyland knowing that it would not be the same as if it was just the 2 of us. This was OK with us. We went with the understanding that we would spend most of our time walking around rather than on rides. We were not certain which rides we would be allowed on and which ones they would turn us away from. We were very happy to be allowed on all of the rides that we really wanted to go on. Rides such as the Haunted Mansion and Pirates of the Caribbean went well even with Rylan. He slept quietly (for the most part) throughout the rides. He took part in some of the rides and kept his eyes open to take in all of the new things. We initially were going to bring both the stroller and the Snugli, however even before getting 20 feet from the car, we decided to turn around and leave the stroller. This was likely the best idea we had. Rylan would stay close to us, like he enjoys, and allowed us to have peace of mind that someone was not going to run off with him. Throughout the park there are stroller parking areas but its difficult to leave an expensive stroller unattended. I enjoy the fact that I did not need to worry about this. There is nothing worse than a heavy pileup of people partially caused by the abundance of strollers. I am proud to say that I was not part of the pileup problems. I will be providing a bit more information on future posts, until then, here is Rylan with one of his new buddies. Written on January 6, 2006 by Kevin. Our first long trip has been a success so far. Rylan slept the majority of the trip from Phoenix to Anaheim and we are now settled in with our free wireless internet. Let the blogging begin. Ever since I was a young boy I have been driving from Phoenix through California and would come across these dinosaurs in the middle of nowhere. For whatever reason, my family and I never stopped to check them out. Over the years though, these dinosaurs have been pictured in movies such as Pee Wees Big Adventure. 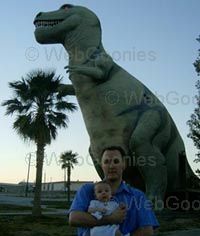 I am talking about the Dinosaurs of Cabazon. The largest man-made dinosaurs in the world. Ms. Dinny, the Apatosaurus, took 11 years to build and is capable of housing an educational and gift store in her stomach. Mr. Rex stands a staggering 65ft tall. I made it a point to stop this time around as I didn't want Rylan to miss this grand opportunity. I would certainly recommend dropping by this place if you are passing through. The address is below. Written on January 4, 2006 by Kevin. Everyone knows the scene, the baby is crying because they have just pooped or pee'd. Regardless of the amount, babies will cry like there is no tomorrow. Now picture this, you have an almost guaranteed way to quiet a baby down. Would you tell everyone or keep it to yourself? I have decided to tell everyone. I have found recently that when Rylan is crying because he needs a diaper change, a simple human to human respect can do a lot. Many people may think that babies are simply dumb and it takes years for them to show any intelligence. I find this hard to believe when I can get Rylan to calm down by talking with him in such a way that he feels like a person, not just a baby. I lay Rylan down on the changing table and as he cries, I tell him what I am doing. I get the diaper and wipes ready and proceed to show him the diaper. Just about every time I do this, he calms down and lets me change the diaper. Why is this? Babies are just like everyone else and they need respect. I give Rylan the respect and communication that he wants and he gives me a moment to change him. He even goes as far as smiling at the diaper. It seems so much like he understands that his diaper will be changed and that his crying is no longer necessary. It seems this way because it is most likely true. I have come to believe that the more respect you give a baby, the happier everyone will be.